The approach of monitoring and analyzing quality of life rests on concepts and methods which are a combination of thinking from the fields of social science, philosophy, psychology, politics, economics and social statistics. Quality of life and wellbeing are goals that have explicit emerged since the last century. The components of quality of life are mainly focused on positive wellbeing but also to negative wellbeing and to future expectations. Quality of life research is interested in evaluations of good and bad states of society, which easily leads to disputes about their value basis. The world is divided into objective and subjective reality; the subjective reality is the perception of ordinary people, whereas the objective reality refers to the definition of experts after having made carefully investigations of reality. There are many possible ways to monitor and analyze quality of life. The problem is that the methods influence the results. A main problem of quality of life can be seen in the relationship between diversity and inequality on the globe. 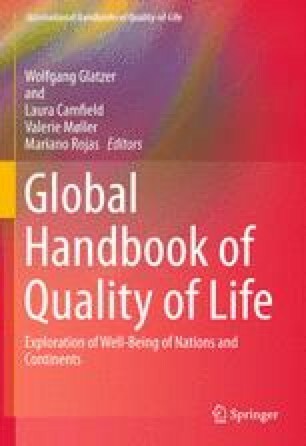 This chapter gives an overview of the topic of quality of life as well of the structure and content of the book. Gallup World Poll. (2010). www.gallup.com. Last accessed on 15 Dec 2011. Veenhoven, R. (Dir.). World database of happiness. http://www1.eur.nl/fsw/happiness/. Accessed 25 Mar 2014. Word Value Survey Wave 5. (2005–2008). Banco de Datos ASEP/JDS. http://www.jdsurvey.net. Accessed 24 Mar 2014.